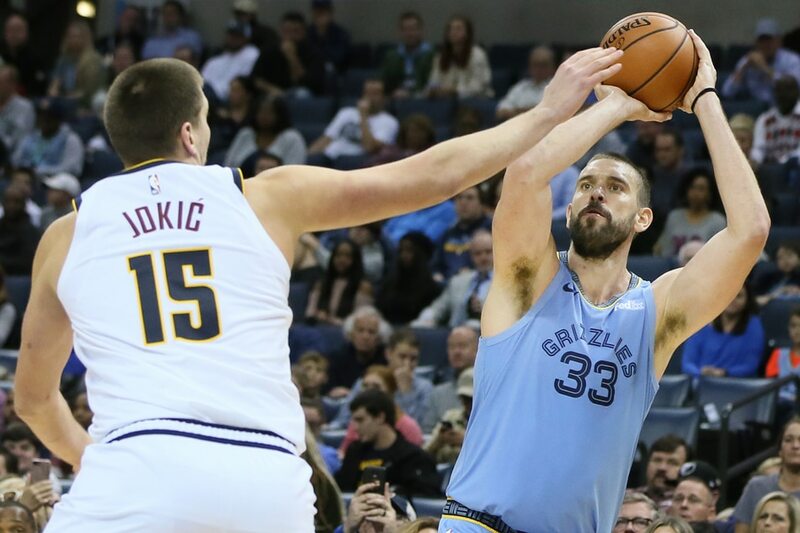 Marc Gasol hit two tie-breaking free throws with 4.6 seconds remaining Wednesday night and the host Memphis Grizzlies survived two late misses by the Denver Nuggets to remain unbeaten at home with an 89-87 victory. Gasol was fouled by Jamal Murray after the Nuggets star had tied the game at 87-all with a 21-footer with 17.8 seconds left. Gasol, who entered the game as the NBA's 9th-leading free-throw shooter of all time among centers with a 77.9 percentage, then calmly made his difference-makers to cap a 7-for-7 night at the line. The Grizzlies outscored the Nuggets 21-15 on free throws, getting six more opportunities. The Nuggets had one shot at a win and a second at a tie in the final 2.4 seconds, but Nikola Jokic misfired on a 3-point attempt and Murray, after grabbing the rebound, failed to connect on a short jumper just before the final horn. The Nuggets trailed by four after a Mike Conley floater with 40.4 seconds left, then caught a break when Trey Lyles was fouled on a dunk with 31.0 seconds remaining that got Denver within two. Lyles missed the free throw, but Juan Hernangomez corralled the rebound and Murray hit from 21 feet with 17.8 seconds left to tie the game at 87-all. The second half, which began with Memphis clinging to a 50-47 advantage, featured six lead changes and six ties, the last of which occurring on Murray's jumper. Gasol and Jaren Jackson Jr. finished with 20 points apiece for the Grizzlies, who improved to 4-0 on the season at home. Gasol completed a double-double with a game-high 12 rebounds. Kyle Anderson added 14 points for Memphis, which won despite just a four-point night from its leading scorer, Conley, who shot just 2-for-9 but found time for a game-high eight assists. Gary Harris had 20 points to lead the Nuggets, who had won five straight. Lyles totaled 16 points and a team-high nine rebounds, Murray logged 15 points and a team-high seven assists, and Mason Plumlee chipped in with 10 points for Denver, which was coming off an eight-point home win over Boston on Monday. Each team used a 10-0 run to take a lead in the first half, with Denver's burst helping create as much as an eight-point advantage in the first period, before Memphis scored the final 10 points of the second quarter to take a 50-47 lead into the break.